CCTV, or closed-circuit television cameras, have become cheaper and more accessible in the last several years, allowing many homeowners and businesses to use them for security. For the same reason, paranormal investigators often use them as well. They’re the same cameras that are in the hallways of my school. They’re found in the woods now too, though hunters like to call them “game cams”. (Aliens and Bigfoot have been caught several times on these game cams… if you didn’t already know.) You can even get them at Walmart. The video is recorded continuously onto a DVR and is usually easily searched if you know the approximate date or time you’re interested in. 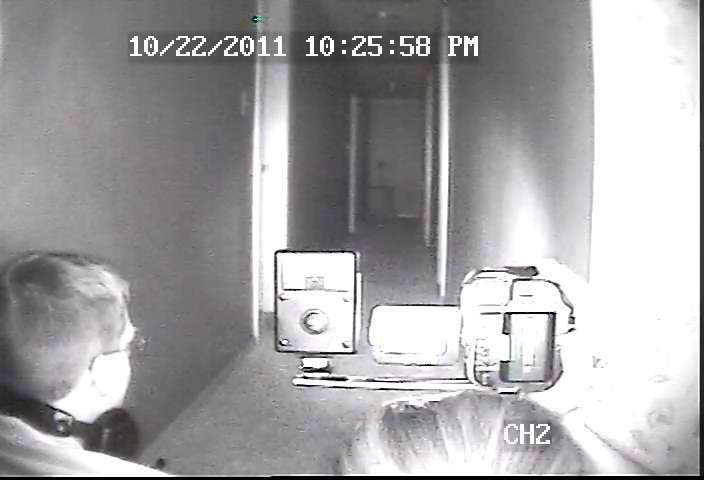 One of our CCTV “DVR” screen shots from the MOSS investigation of a residence back in 2011. The combination of CCTV and the popularity of the paranormal has provided a great opportunity for business owners to play ghost hunter, as they capture and publicly disclose their “ghosts”, often taking advantage of the publicity and hype that comes with it. When you see these captures on video, you don’t often get much background information on the location. No one is there to answer your curious questions. What was behind the camera? Was anyone there at the time? (There are many other questions I could think of.) Now days you have to wonder if the video was doctored, embellished, faked, etc. Was it a publicity stunt for an upcoming “found footage” movie? Even so, they can be fascinating and appear very real… and if you’re like me, deep down you really WANT them to be authentic evidence of the paranormal. The most recent example was brought to my attention by Ghostsnghouls.com. Watch it and then find my commentary below. Supposedly there are no windows behind the camera, making the flickering and lighting changes seem very mysterious. And the flicker just before the blackout seems a bit too perfect for me. I wish I had several pictures of this room in the daylight so that I could get a feel for the whole place. And does it all seem just a little Hollywooded up to you? It’s only missing an edgy score by Hans Zimmer, am I right? It’s definitely fascinating video though. I bet this pub has named a nicely priced drink after this “ghost” as well. …is also from a pub (why always a pub??) and was captured several years ago in Britain. I really really REALLY REALLY wanted this one to be real. Like a lot of these videos, this is almost guaranteed to be evidence of a lack of cleaning up high in corners of the rooms where these cameras are mounted. I could find several cobwebs in a few corners of this room right now if I wanted to. Watch closely and you can identify this ghost as a fly or some other kind of insect. Often, a simple cobweb will cause excitement and claims of paranormal activity. Don’t you just love it? You had the story worked up in your mind, didn’t you? The centuries old pub has an old employee that loved the place so much that they help clean up overnight. Either that or it’s a residual haunting and it’s just a normal night at work, serving beer and cleaning tables. Right? Please oh please oh please. Having a brain ruins all the fun, doesn’t it? This entry was posted on Thursday, April 17th, 2014 at 12:09 am	and tagged with big seance, britain, CCTV, CCTV footage, closed circuit television, cob webs, cobwebs, cobwebs and CCTV, DVR, game cams, ghost, ghost footage, ghost hunters, ghost hunting, ghost on film, ghost on video, ghosts, haunted, haunted pub, hype, insects and CCTV, paranormal, paranormal activity, paranormal evidence, paranormal footage, paranormal investigation, paranormal investigators, proof of ghosts, pub ghost, pub ghost captured on CCTV, pub ghosts, Pub ghosts captured on CCTV cameras, publicity, seance, security camera, security footage, skeptic, skeptical, skepticism, spirit, spirit communication, spirits, spiritual, the ghost of ye olde man and scythe, UK, video, wolfe pub, wolfe pub ghost, ye olde man and scythe and posted in Paranormal Evidence, Paranormal Investigation Topics. You can follow any responses to this entry through the RSS 2.0 feed. Nice post. Finding good Youtube videos of ghosts is a real challenge. I personally think the second one was a bug on the lens. Having dealt with … more interesting things lately, I wonder if cameras can really capture spirits. I’d certainly like to think it’s possible, too. however, it’s so hard to find compelling evidence. For instance, there’s a lady who I’m 99.5% sure has a spirit behind her at all times. I’ve seen tons of photos of her, but not one has picked it up. The last time I worked at the hotel on an overnight (I was just filling in, after not working there for months) one of the security cameras had a spiderweb display. It gave me a start, but it only took a second to actually identify it for what it was. Ha! I would have cried right there with ya. 🙂 I bet you have some stories… and I bet you found Cornelia’s hotel post fascinating today. When the battery starts to die on my handheld light source, it does that flickering thing and looks exactly like that ghost pub footage. It’s very disconcerting and really exciting until I remember what’s really causing the phenomena. I trust video! But you’re right – only when I know more than what’s on the screen. Too many normal things appear odd not to know more before making a decision. Well done entry, Patrick. Thanks, Randy! I remember in our first couple of investigations, we had a few DVR “ghosts”, until I got used to its glitches. 🙂 Probably should go back into a few of those old reports.